LAS VEGAS, NEVADA, April 8, 2013—General Cable is pleased to release and demonstrate the new Gepco® Brand Online Paneldesigner™ at the 2013 NAB Show (Booth #C7408) April 8 -11, 2013. From wall plates to custom rack-mountable chassis, Gepco has long been able to produce almost any type of custom panel for Broadcast or Professional A/V applications. 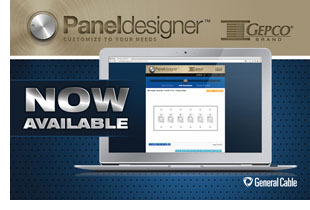 Now, Paneldesigner provides a time-saving, visual interface for designing custom panels. Paneldesigner allows the user to choose the panel type, size, material, finish, connectors and lettering options so the user can quickly and easily submit his or her custom panel for a quote or order. Expandable menus provide easy reference for the multitude of connectors available, while the drag and drop interface makes designing a panel simple. A user can get started with just a few clicks by typing in an email and password. When registering for a full account, all of the user’s projects can be stored within the account and be edited and referenced at any time. The online Paneldesigner is available for use and can be reached from the Gepco.com Website. General Cable (NYSE:BGC), a Fortune 500 Company, is a global leader in the development, design, manufacture, marketing and distribution of copper, aluminum and fiber optic wire and cable products for the energy, industrial, and communications markets. In August 2009, Gepco International was acquired by General Cable. For more information about General Cable products, please contact your local sales representative or visit our Web site at www.gepco.com or www.generalcable.com. Gepco® has been an industry-leading brand of studio, stage and broadcast AV cables and cable assemblies for 30 years. As a complete solutions-based supplier, Gepco also offers value-added service and distribution of connectors, cable management products, patch panels, and wire and cable accessories.